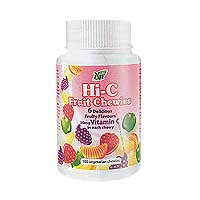 Nn Hi-C Fruit Chewies are a smart and simple way to ensure that your little cherubs get their required dosage of vital vitamin C everyday. Kids love it. Adults love it too! SKU: COS65 Category: Body Health Brands: Nn. ‘ e all know that daily supplementation with Vitamin C helps to strengthen the immune system and ward off common ailments like colds, flus, and coughs. But getting kids to take sour Vitamin C supplements can be quite a challenge. 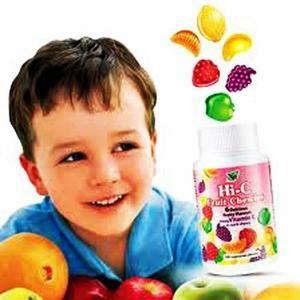 Now, with Nn Hi-C Fruit Chewies, you can be sure that your kids will want to take their Vitamin C daily! Why you need daily Vitamin C supplementation? Glucose, Sugar, Water, Pectin, Ascorbic Acid (INS 300), Sodium Citrate (INS 331), Permitted Fruit Flavorings (Apple, Mango, Strawberry, Lemon, Orange, Blackcurrant), Permitted Coloring – Allura Red (INS 129), Sunset Yellow (INS 110), Tartrazine (INS 102), Brilliant Blue (INS 133). Take 2 – 6 chewies daily.